In the middle of the catastrophic 2008 recession, Aditya, a jobless, penniless man meets an attractive stranger in a bar, little does he know that his life will change forever….. When Radhika, a young, rich widow, marries off her stepdaughter, little does she know that the freedom that she has yearned for is not exactly how she had envisioned it….. They say Homing Pigeons always come back to their mate, no matter where you leave them on the face of this earth. 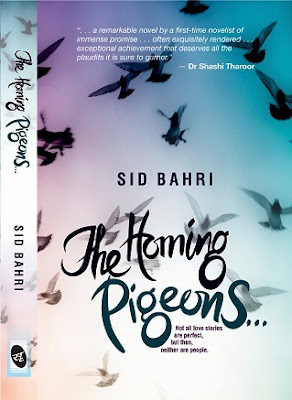 Homing Pigeons is the story of love between these two unsuspecting characters as it is of lust, greed, separations, prejudices and crumbling spines. When I flipped through the pages of the book, I noticed that the book is about the two characters, Aditya and Radhika. When I began to read the book, I felt that there are two different stories, of Aditya and Radhika. The story starts with Aditya Sharma, banker from Citibank, losing his job due to the recession and how much he relies on his wife's income. Though legally married, love has vanished between the couple. He meets a young lady at a bar that twists his life forever. Who could imagine, he would take up a profession of a gigolo and become famous among the young women. Radhika is a young widow, earlier a divorcee who is bored in life after the death of her rich husband and marrying off her step daughter. As the story proceeds, Sid explains how Aditya and Radhika met during the school days, how love blossomed, how they were separated due to the misunderstandings that forced them to make wrong decisions and both their families opposing their wedding. It makes an interesting juicy read and Sid has well woven the two stories together, as a climax. I know most readers might dislike this. Not all love stories are perfect, but then, neither are people. A hotelier by education, an ex-banker and a senior executive in the outsourcing industry, Sid gave up a plush career in the outsourcing industry to follow his passions. Based out of Ranikhet, he is now a struggling entrepreneur and a happy writer. A self- proclaimed eccentric, he is an avid blogger who loves to read and cook. Cooking stories, however, is his passion. The Homing Pigeons is his debut novel. This book review is a part of "The Readers Cosmos Book Review Program". To get free books log on to www.thereaderscosmos.blogspot.com.